Fresh off losing their top two men's seeds, Sydney International organisers were left with a nightmare scenario on Saturday when their top two local hopes were drawn against each other in the first round. Just hours after top seed Jo-Wilfried Tsonga and his French compatriot Richard Gasquet withdrew from the Australian Open warmup tournament, Australian number one Marinko Matosevic was drawn against compatriot Bernard Tomic in the first round. The 27-year-old Matosevic, who was the ATP Tour's most improved player last year after jumping from 201 to 49th in the world, has moved ahead of Tomic, who faded in 2012 after a meteoric rise in 2011 and finished the year ranked 52nd. The 20-year-old Tomic, who was also dumped from the Australian Davis Cup team because of doubts about his commitment, has actually been in good form at the Hopman Cup in Perth, winning all three singles matches, including a 6-4 6-4 victory over world number one Novak Djokovic. 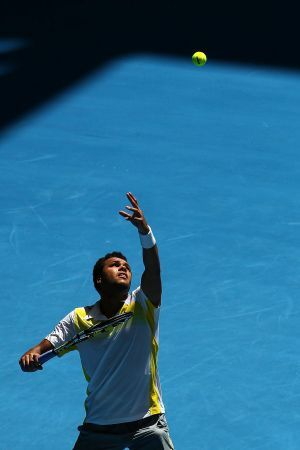 World number eight Tsonga was earlier forced to withdraw from the Sydney tournament with a hamstring injury that he sustained at the Hopman Cup and he will be facing a battle to be fit for the January 14-27 Australian Open in Melbourne. "Unfortunately Jo-Wilfried Tsonga sustained an injury in Perth and has been forced to pull out ... with a left hamstring injury," Sydney tournament director Craig Watson said in a statement. Gasquet, who would have been top seed after Tsonga's withdrawal, pulled out for "personal reasons", Watson said. The 10th-ranked Gasquet reached the final of the Qatar Open against a resurgent Nikolay Davydenko and possibly felt he had enough match practice under his belt before the year's first grand slam begins at Melbourne Park on January 14. American John Isner, who was forced to withdraw from the Hopman Cup with a niggling knee injury, was installed as the top seed at Sydney and has a bye into the second round.